ARM vs. Fixed Rate Mortgage – Which One Is Better For You? If you’re eager to buy a home, chances are you’re struggling with what type of mortgage rate you want. Either an adjustable rate mortgage (ARM) or a fixed-mortgage rate. The question is, which one is better and what are the key differences. An ARM, which is known as a variable-rate mortgage, starts out as a fixed interest rate that’s lower than a comparable fixed-rate. Over time, the rate period adjusts to either three, five, seven, or ten years, according to the market indexes. If the indexes increase, your payment will increase too. Also, don’t assume your pay will automatically decrease if the indexes don’t go down. Always read the fine print on your mortgage loan application. In a fixed-rate mortgage, the payment always stays the same. The amount never changes no matter if the life of the loan is 15, 20, or even 30 years. Moreover, you may wonder why you need one loan type over the other. When is ARM a Good Idea? If you’re a first-time homebuyer who desire longterm options, an ARM is a better option. If you don’t mind moving on before the introductory period’s end, you’ll benefit from having lower payments. Since you’ll have a lower payment option from the lender, you’ll qualify for a more expensive home in the future with an ARM. A lender will apply a new loan rate once the initial, fixed period ends. He or she will also set a margin amount and calculate the new rate. This new rate can raise concerns for conservative borrowers; they don’t know if the rate will decrease or increase. However, there are limits on most ARMs that prevent the interest rate from changing too frequently in the adjustment period of the loan. When market conditions are low, people with ARM loans receive great benefits. You should consider the initial rate, initial rate period, and the adjustment rate before signing. Compared to a 30-year fixed-rate mortgage, the initial interest rate is higher than an adjustable rate mortgage (ARM). Regarding the initial three, five, seven, or ten years, the interest rate is typically fixed with an ARM. Semi-annually, it’s subject to change during the life of a 30-year loan. During the initial period, the rate is lower than a fixed rate; this really draws people in. Moreover, ARMs are more affordable than other programs that are available. Adjustment rate mortgages are beneficial for people who plan to move in a few years down the road. You can benefit from the initial rate period and then sell off before future changes are made. Your initial monthly payment is lower with an adjustable rate mortgage if your initial rate is low. Also, you’ll be able to save money with an ARM due to having lower payments. This is great if you ever want to buy a home or refinance in the future. Even though an ARM is capable of increasing over time, having a lower initial payment will give you time to prepare for future adjustments. There are several types of caps that may prevent your rate from increasing your payments. The types of caps can range from the rate at which your payment can grow to interest rate caps. You determine interest rate caps by how much rates can change as it adjusts, and how it can change during a loan’s lifespan. Overall, a lender will give you more clarification regarding your payment amounts and the risks at hand. When Is Fixed Rate Mortgage a Good Idea? If you have a secure job that you are consistent with for a long period of time, then a fixed mortgage is more ideal. Retired individuals can benefit from this type of mortgage rate because the payments are fixed. As a result, it’s easier to manage finances. There are many pros and cons comparing fixed rate mortgages to an ARM interest only mortgage. The pros of fixed-rate mortgages are having peace of mind knowing your payments and interest rate stays the same, along with versatile mortgage length options. The cons are that you locked into the loan unless you refinance. Also, the interest rates and monthly payments are much higher than it’s ARM and interest-only counterparts. There are many reasons why certain people choose to have a fixed rate mortgage with the most prominent being that the payments don’t change. If you take out a fixed rate mortgage, the lender has the option to amortize the payments on the loan. In addition to, the lender is able to determine your loan amounts in advance. Once the amount is known, that number is divided by the number of monthly payments the borrower makes. The amount won’t change because there is no fluctuation. Other than home insurance premiums and property tax rates, the monthly payment amount doesn’t change at all. Regarding ARMs, the interest rate can change as time progresses. This can leave room for unexpected rate increases. In a nutshell, your loan could get more expensive over time. One major advantage of a fixed loan is that the interest rate never changes during the lifespan of the loan. You won’t be surprised down the road. You’ll keep your initial interest rate over the 30-year lifespan of the loan. Since fixed rate mortgages are less complex, it’s easier to search for different options compared to ARMs. Closing costs and introductory interest rates are what you have to consider with ARMs. Also, length of introductory periods, rate changes, and how the rate can change over time are factors to consider with an adjusted rate mortgage. One will also have to consider the graduated payments over a span of time, and how those payments can increase too. The loan on a fixed rate stays the same. Adjusted mortgage rates on the other hand increase in cycles; it can be a great asset for people who have a specific agenda. Loans that have a fixed interest rate never changes. ARMs start off with a specific interest rate but then increases over time. An adjustable rate mortgage that’s “5/1” means that the rate will stay the same for five years with future, annual adjustments. ARMs are growing even more in popularity. As a result, the initial rate can be for seven, ten, or even 15 years at most! Once the initial period is complete, the interest rate is based on the index and margin. The rate may be a private rate, or a published integrate such as London Inter-Bank Offer Rate (LIBOR). Also, the margin is a percentage that’s added to the index. 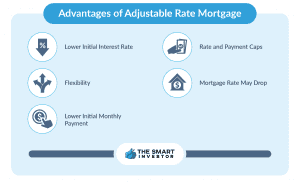 Even though ARMs are initially lower than fixed-rate loans, adjustable rate mortgages interest rates can increase over a period of time.